Visits to the doctor’s office for an annual flu shot may soon be outdated, thanks to a painless do-it-yourself flu patch that is scheduled for clinical trials next spring. The study also suggested that the use of vaccine patches might increase the rate at which the population is vaccinated against influenza. After comparing simulated vaccine administration using a patch and by conventional injection, the percentage of test subjects who says they’d be vaccinated grew from 46 percent to 65 percent. “Our dream is that each year there would be flu vaccine patches available in stores or sent by mail for people to self-administer,” says Mark Prausnitz, a professor in the School of Chemical and Biomolecular Engineering at the Georgia Institute of Technology. “People could take them home and apply them to the whole family. We want to get more people vaccinated, and we want to relieve health care professionals from the burden of giving these millions of vaccinations.” The research on patient acceptance of vaccine patch immunization is available online in Vaccine and will appear in a later print edition. The study, which included researchers from Emory University and the Centers for Disease Control and Prevention, is believed to be the first published report of a head-to-head comparison between microneedle patches and traditional intramuscular injection for the administration of vaccines in human subjects. The patches consisted of arrays of 50 microscopic needles about as tall as the thickness of a few hairs. 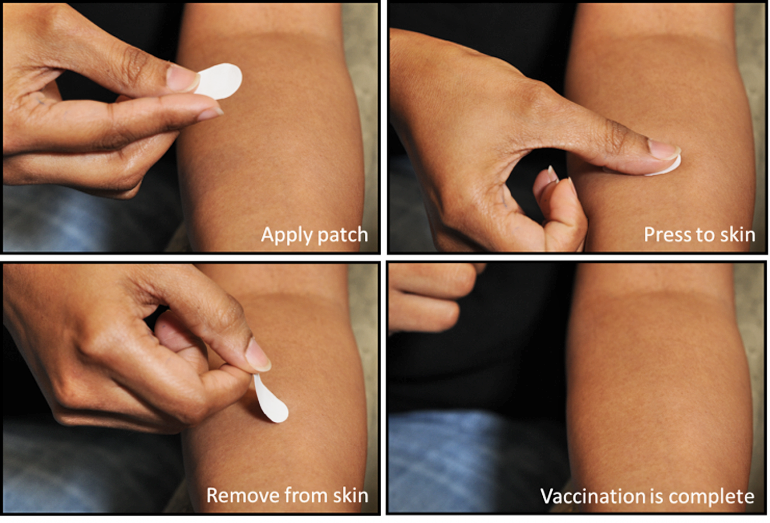 When used for vaccination, the patches are pressed painlessly onto a person’s forearm to carry vaccine into the outer layers of skin, where they prompt an immune reaction from the body. “We found that everyone was capable of administering a microneedle patch appropriately, though not everyone did on the first try,” Prausnitz says. “If this holds for the population as a whole, that would have a tremendous impact on preventing disease and the cost associated with both influenza and the vaccination process,” says Paula Frew, an assistant professor in the Emory University School of Medicine and a co-author of the study. “In addition to the preference for the vaccine patch, we found that a large majority of the people willing to be vaccinated would choose to self-administer the vaccine,” says James Norman, the study’s first author, who was a Georgia Tech graduate student when the research was conducted. Less than half the US population receives vaccination against influenza each year. Several thousand Americans die of complications from the flu each year, and as many as 200,000 are hospitalized. Increasing the immunization rate could cut the deaths, hospitalizations, and costs associated with the disease, Prausnitz notes. Use of a vaccine patch could potentially also reduce the cost of vaccination programs. For influenza, the cost of storing and administering the vaccine—along with patient time to visit a clinic—accounts for as much as three-quarters of the total cost. If microneedle vaccine patches could be produced for about the same cost as current flu vaccines, self-administration could provide significant cost savings to the nation’s health care system. The National Institute of Biomedical Imaging and Bioengineering, part of the National Institutes of Health, supports the research. The content is solely the responsibility of the authors and does not necessarily represent the official views of the National Institutes of Health.